As well as expanding our line of sock yarns to include new semi-solid and multi color yarns we have now added a new 2 ply silk for those of you who simply must have the best for your lace projects. 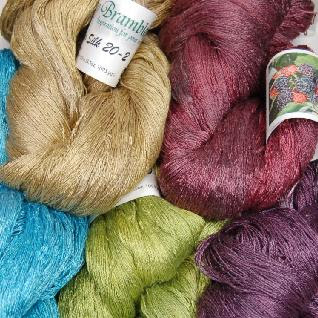 Ivy Brambles Pure Silk is 100% finest silk, in 3.5 oz skeins (100 grams) and 1093 yards (1009 meters). Award winning designer Tonia Barry will be featuring this yarn in an upcomming project, and we would like to extend our thanks to Tonia for her support. As with all our yarns Pure Silk can be purchased online at The Yarn and Fiber Company.